With more access to fresh fruit and ingredients like avocado and strawberries, these shakes are ready and refreshing. In a blender, combine avocado, banana, pineapple and milk until smooth. Add lime juice, honey, vanilla and nutmeg. Whirl until frothy. Thin with additional milk if needed. Garnish: Preheat broiler.Whip cream until stiff peaks form; refrigerate. Place 2 graham crackers on a small baking sheet. Top each with chocolate, then 2 marshmallow halves. Broil for 30 to 60 sec on centre rack or until marshmallows are golden. Top with remaining 2 crackers. 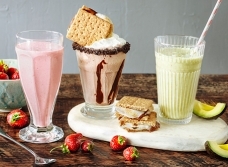 Milkshake: In a blender, combine ice cream and milk until frothy.If you’d like thicker milkshakes, add more ice cream and whirl again. Spoon chocolate sauce onto a small plate. Place cookie crumbs on another small plate. Roll rim of 1 milkshake glass in chocolate sauce then rim with crumbs. 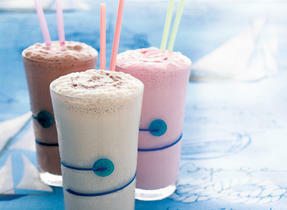 Repeat with another milkshake glass. Using a spoon, drizzle half the sauce in 4 spots down the inside of one of the glasses (to form stripes).Fill glass with shake. Repeat with remaining glass. Top with whipped cream then stand a s’more in each shake. Sprinkle with any remaining cookie crumbs. Serve with a spoon. Avocados should be ripe but not overly so. Press gently and they should just give to the pressure. Try pure maple syrup instead of honey. Try making the milkshake into popsicles. If your strawberries aren’t at the peak of perfection, sprinkle with 1 tbsp (15 mL) granulated sugar and 2 tsp (10 mL) lemon juice. Let stand for about 10 min before making shake. You can also use frozen strawberries, but you may need to increase milk to thin slightly. 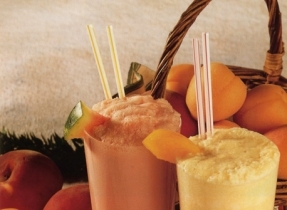 Use different fruit as it comes into season to make up new milkshake flavours, such as peach or blueberry. Get all your garnish ingredients ready before starting shake. Try coffee or vanilla ice cream. Press a gummy worm into each warm marshmallow for a fun treat for kids. 80 people love this recipe.